In a world obsessed with celebrity culture and consumerism, its hardly surprising that artists would begin to exploit this, and turn it around for their own benefit and reputation – a very clever tactic to employ. 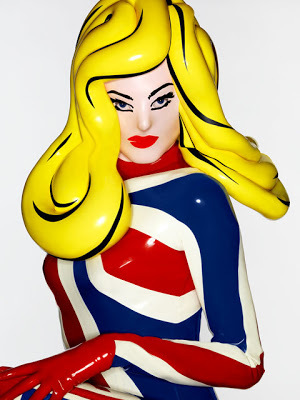 Meet Pandemonia, a 7ft inflatable latex outfit/creation by an anonymous artist/designer, who’s purpose is still not fully known, but from what I can establish, the idea is to highlight the ridiculous nature of celebrity culture, and portray how the pursuit of perfection is a constant and never ending battle. At the moment, you may be completely unaware of Pandemonia – I only stumbled across her in an article for Stylist Magazine which I was reading on my way to work – Thankfully she hasn’t hit the world of ‘celebrity’ magazines, and is remaining more of a art piece at high-end events, such as London Fashion Week and exhibition openings. However, was this all part of the plan? Did the inventor of Pandemonia want her creation to be a high-end, untouchable celebrity figure, so that she would receive recognition from world renowned designers? Or is this just the start? In my opinion, any piece of art that creates controversy is good, as it gets people talking – or in this case, gets the work ‘famous’. The ambiguity surrounding Pandemonia is also very intriguing, as there are aspects of the design that are totally unique, for example, the concept of creating an outfit, that actually becomes a character and brand identity all in its own right, is very clever indeed, yet the physical design of a tall, plastic, size zero, blond bombshell is a stereotypical ‘celebrity look’ – but then again, is that the whole point? – To mock the system? In an interview with Vice Style, Pandemonia spoke of her fear of ‘deflation’ and wanting to stay unique; otherwise she would ‘lose her irony and possibly become fashion’. But does this mean she succumbed to the cut throat world of celebrity, and wanting more than 5 minutes of fame? There are so many things about this creation that seem to be a contradiction!